The Koetsu Black's biggest crime is that it's not the newest kid on the block in this price range. The Black has quietly gained internal improvements, most notably the use of silver-clad copper wire like the upper models. Koetsu's Entry level Black is GOLDEN! I upgraded from a Benz Micro MC L2 that I still have on another VPI JMW Arm wand and switch back and forth, but right now it is all KOETSU all the time. As I go through my LP's and listen to this new sound they have with the BLACK, I'm in love. This is a wonderful product, The Benz was great mind you, but the three times more expensive Black is a wonder that must be heard to be understood. If you can get an audition please do so. If you can take a $1600 flier on a cartridge then this is about the best way I can think of spending the money. 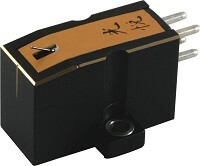 If you love that LP collection and have the Table Arm and Phono Stage ready get one of these then you write a review.